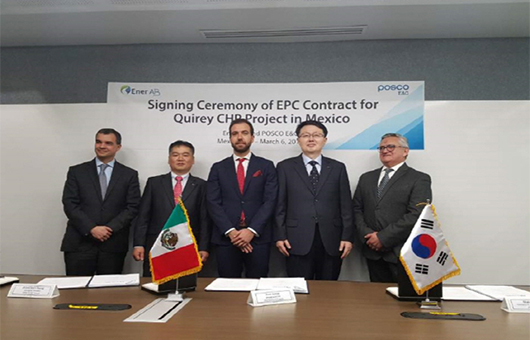 South Korea’s Posco Engineering & Construction Co. (Posco E&C) said Monday it has won a $100 million project to build a 100-megawatt (MW) combined heat and power plant for Mexico-based Ener AB. The plant will be established in Coahuila, Mexico to supply stable power to the Magnelec chemical plant nearby. Posco E&C aims to complete the construction in 24 months from its commencement date. Ener AB is a joint-venture between U.S.-based power company AES and Mexico’s Grupo Bal. The AES Corporation operates power generation facilities with a combined capacity of 34,732 MW in 18 countries and has kept up business ties with Posco E&C since 2006. The latest deal raises the company’s total achievement in Latin America to $10 billion. Posco E&C advanced into the Latin American market for the first time in the industry in 2006 with a 400 billion won coal-fired power plant deal in Chile. Since then, it has successfully expanded its presence in the market with addition of two coal-fired power plant projects in Chile in 2007 and two combined heat and power plants in Peru in 2009. Last year, the company completed its construction of a 391-megawatt gas-fired combined cycle plant in Colon, Panama.